The members of the Killington Artist Guild will again have a great opportunity to display there work and attract visitors to our gallery in Killington during prime ski season this year. The board of directors has arranged to reserve one of the indoor glass display cases at the State of Vermont Welcome Center located in Fair Haven for the month of January 2016. The KAG display that was placed there this past January drew a lot of attention according to the Welcome Center staff from visitors traveling on the prime Rt. 4 Vermont and Rt. 87 gateway from New York. The staff there is proactive and works very hard to inform visitors of all the attractions in the Rutland/Killington region. Small to medium size pieces are best suited for this display. Please feel free to call Rob Pye (483-6890) for details. The pick up date for art will be announced mid December. In the mean time be planning something special for this great opportunity! Join us at the Sherburne Memorial Library, at 2998 River Road, in Killington on Saturday, November 21st. There will be a Holiday Art and Craft Fair featuring local hand made arts and crafts, a bake sale and raffle. Lunch will be available. Proceeds to benefit Hand In Hand Community Service Programs and Friends of the Sherburne Library. We have a few remaining vendor tables available at this time. Please contact us to reserve. Tables will be filled on a first come basis. Note: We’ll place an order for lunch, so please bring cash or your own lunch if you prefer. We will have coffee and breakfast provided and you have the option to bring your own lunch or we will order in from one of the local delis. We will have menus there in the morning so you can place your order (make sure you bring money if you want to order lunch). Please join us for a fantastic dinner and silent auction at The Garlic, in Killington on Wednesday, November 11th. The Garlic’s full menu will be available throughout the restaurant. Tapas are available in the bar area. The silent auction will include a wide variety of items and services donated from local businesses, artists, craftsmen and other individuals. Proceeds from the evening will benefit Hand In Hand Community Art, Poetry, Humanities, and food/meal programs. As always, Hand In Hand programs are open to all, encouraging supportive and sustainable community growth and development through creative arts and nutrition. Her energy bubbles up, up, and over the phone line. Alice Sciore’s life experiences are the kind you might imagine an artist has, and she is effervescent in her retelling of them. From the first piece of art she made as a child, to what it was like to be an artist in New York City for a time (“exciting as hell”), and her current spot as one of the ten artists in EMMA (East Mountain Mentoring Artists). First she creates a design on the wood and then brings it to a woodworker to cut, before she begins sculpting it with sandpaper and mechanical sanders. Sciore’s work is currently on display at Compass Art Center in the exhibit “What EMMA Loves” — a sort of “favorite things” collection of work by the ten artists. The artists of the Rutland-based group, EMMA (East Mountain Mentoring Artists), will conduct a series of artist talks, demos and classes to share their breadth of artistic skills and experience. The series will take place on Sunday afternoons at the Compass Music and Arts Center while their exhibit “What EMMA Loves” is on display. All events are free. See below for dates and details on each event. Mary Crowley, the author and illustrator of the children’s book, “I Love to Visit My Grammy,” will explain how she came to write, illustrate and get the book published. In addition, she will talk about her second book, and the one she is working on now. The Killington Art Garage presents a “Sip and Paint” Workshop with the Killington Arts Guild’s long standing past president Sally D.Curtis on ALCOHOL BASED INK ABSTRACTS, on Ceramic Coasters, Thursday, Sept. 17, 2015 @ 6:30 pm. Friday, Aug. 14 at 5 p.m. — BRANDON — EMMA member Karen Seward titled one of her recent paintings “For the Love of Painting,” which not only sums up the group’s upcoming exhibit at the Compass Music and Arts Center, but also their purpose. EMMA, the East Mountain Mentoring Artists, exists to support the love of creating. “What EMMA Loves” is the second group exhibit for the Rutland area visual artists and opens on Aug. 14 with an opening reception to be held on Friday, Aug. 21 from 5-7 p.m.
Exhibiting members include free-spirited painter Mary Crowley; figurative painter Christine Holzschuh; ordinary-into-extraordinary photographer Lowell Snowdon Klock; Ann McFarren, an oil and watercolor landscape painter; painter of stories Betsy Moakley; New England painter Rae Newell; wood sculptor and multimedia artist Alice Sciore; painter of light and color Karen Seward; traveling painter Heather Shay; and Christine Townsend, a painter and sculptor of animals. The exhibit at Compass will run through Nov. 1. This exhibit also celebrates Vermont Arts 2015, in celebration of public funding for the arts. 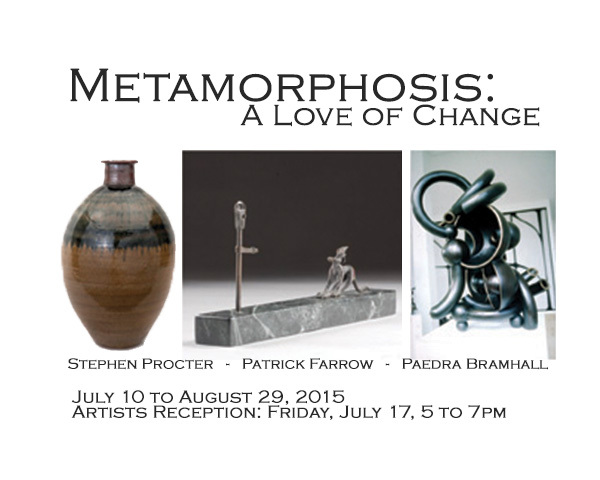 The exhibit Metamorphosis: Love of Change, refers to all three artists’ individual changes over the course of their lives. Each arstis will touch upon their metamorphosis as artist on Monday, August 17 at 6:30 pm as they take the stage at Rutland’s Paramount Theatre for an Artists’ Talk. Over the decades, Paedra has transformed as an artists through various mediums and techniques. Stephen Procter made the decision later in life to metamorphosis himself into a fulltime potter. He will bring a large potter’s wheel to demonstrate how he makes his large vessels. Susan Farrow the wife of late Patrick Farrow will speak about his process and changes throughout his career. Please join us after the talk for a reception with lite snacks and beverages served at Chaffee Downtown – 75 Merchants Row, Rutland, VT, as people will be able to enjoy the Metamorphosis: Love of Change exhibit. THIS show, METAMORPHOSIS at the Chaffee Art Gallery is worth seeing !!! the Paramount Theatre in Rutlandfor a 3 Way talk by the artists , Paedra, Susan (for Patrick), and Stephen. In this presentation you will get personal views of what these 3 Artists have given to Vermont, >>> what their journeys have been like <<< to where their work speaks and resonates today. I will speak on stage and show many images of my art which will speak to my journey as a full time artist over the past 45 continuous years , and as a transgendered artist , and the many metamorphosis which I have and continue to go thru as I chase my muses. I hope to see you on Monday 17 August. Since I came back to Vermont 45 years ago to my home, my roots, to start growing my art, to continue my journey in the summer of 1969, and then from 1970 to this date much has changed. I will speak to those METAMORPHOSIS'S of both my art ( art glass, bronze sculpture, ink painting, digital prints), and self ( Peter > Paedra ) in my Artist's talk on 17 August , 7 PM , Paramount Theatre, Rutland. Meet Susan Wacker-Donle. She first started collecting perfume bottles as a Design Director at Elizabeth Arden. "I was asked to work on a new bottle design for our iconic fragrance Blue Grass. During my research I became enamored with the classic scent bottle creations from the past and started my collection scouring antique stores and flea markets". Because of her extensive background in the Beauty and Fragrance industry, her collecting interests in perfume packaging runs the gamut. "I have everything from commercial fragrance packaging from the 20th century, including ancillary items such as solid perfumes and dusting powder jars, to Devilbiss atomizers. My collection also contains a vast array of advertising created to support the brands of Elizabeth Arden, Dior, Chanel, Coty, just to name a few. My appreciation of fragrance packaging was also the catalyst for collecting cosmetic packaging from the past." A cosmetic packaging and graphic designer by trade, she was the Senior Design Director for Fragrance at Elizabeth Arden responsible for the launch of Elizabeth Taylor's White Diamonds, Elizabeth Arden's 5th Avenue, Karl Lagerfeld's Photo and Sun Moon Stars, and Fendi Uomo, to name a few. As Art Director for L'Oreal, cosmetic packaging and display / merchandising design were her primary responsibility. As Senior Design Manager for P&G Gillette, she directed their male skin care packaging creative worldwide. She was the Design Consultant for the niche prestige perfume house Bond no. 9 in NYC which involved the creation of their fragrance packaging and corporate branding, directing and greatly contributing to the package and bottle design for the first 16 fragrances launched. Currently, as Design consultant for Living proof in Cambridge, MA, her position includes creating hair care packaging, merchandising and advertising for their products sold in Sephora, Ulta and high-end salons. She is also Vice President and Webmaster / Web Design Director for the Killington Arts Guild, a non-profit organization in Vermont that promotes the works of our local creative community through art exhibitions, poetry readings and creative demonstrations (www.killingtonartsguild.org). Susan also finds time for other interests, including collecting Roseville Pottery, Lalique & Verlys glass, and costume jewelry from the 30's, 40's and 50's. She enjoys Skiing and Tennis, and is a semi-professional fine art photographer selling prints of urban, Hawaiian, & rural landscapes in Vermont and on-line. Susan has been an IPBA member for many years. "All of my convention experiences have been wonderful. I especially enjoyed the auctions put on by Monsen and Baer. I am looking forward to attending a convention again soon but currently my professional commitments have kept me from the event." Marguerite Jill Dye / A Rave Review of "Stone"
Lost Nation Theater's brilliant performance of "Stone," a beautiful, poignant, and riveting play by Kim Allen Bent, thrilled me to my core. Hurry to Barre, Vermont, for one of its last five performances! Among its star studded cast, each playing multiple characters, is Rutland's very own Sandra Stillman Gartner. We experienced the beginning of Barre's stone industry in the late 1800s and its heyday in the early 1900s through the lives, passion, and struggle of the quarrymen and shed workers and their families who came from northern Italy, Scotland, Sweden, Canada, and France. The play was primarily based on actual workers' and residents' interviews in the 1940s during the Federal Workers' Program as part of the New Deal. The hopes, anticipation, and excitement of the immigrants was palpable through dialog, dance, and toe-tapping song, just as was their fight, fear, and defeat when accidents and lung disease (from granite dust) stole their young lives. In Barre, there was "widow street, though there were widows on every street." No wonder Barre was a breeding ground for socialists and anarchists where workers fought for their lives by fighting for workers' rights. "Stone" teaches, compels, enchants, and excels. It is theatre as social criticism like George Bernard Shaw, and the heart-warming life stories of our and our neighbors' ancestors. It brought to my mind, "How Green is My Valley" about the Welsh miners, and is in a sense, every man's tale. If you live in Vermont, or any other state where our foundations were built on the lives of our workers, this performance is for you. Lost Nation Theater normally performs in Montpelier but "Stone" is presented inside the Vermont Granite Museum of Barre where we can touch the very tools and stone that these courageous men quarried, cut, blasted, and polished. Bravo Lost Nation! Hats off to a very talented team of actors, musicians, writer, director, producer, and the many hands that helped create such a stunning production. Final performances are tonight (Thursday at 7pm), Friday and Saturday (8pm), and Saturday and Sunday matinees (2pm).